Cursed with a horoscope that promises a marriage of Death and Destruction, sixteen-year-old Maya has only earned the scorn and fear of her father's kingdom. Content to follow more scholarly pursuits, her world is upheaved when her father, the Raja, arranges a wedding of political convenience to quell outside rebellions. But when her wedding takes a fatal turn, Maya becomes the queen of Akaran and wife of Amar. Yet neither roles are what she expected. As Akaran's queen, she finds her voice and power. As Amar's wife, she finds friendship and warmth. But Akaran has its own secrets - thousands of locked doors, gardens of glass, and a tree that bears memories instead of fruit. Beneath Akaran's magic, Maya begins to suspect her life is in danger. When she ignores Amar's plea for patience, her discoveries put more than new love at risk - it threatens the balance of all realms, human and Otherworldly. Now, Maya must confront a secret that spans reincarnated lives and fight her way through the dangerous underbelly of the Otherworld if she wants to protect the people she loves. Inspired by Indian mythology. I highly recommend The Star-Touched Queen for fantasy fans and for suckers for magical retellings with their own unique twist. I would have loved to see more development between Maya and Amar, I feel like they would have been thick as thieves given the time and god knows I would love to see a mischievous Amar! Also the world building? Oh I wanted more and more, Chokshi has such a lyrical way of writing, I would compare it to Rutkoski and Ahdieh, it’s beautiful and has the ability to pull you into the story and allow you to experience everything first hand. I never wanted to leave the magical Night Bazaar with its lush wildlife and vivid scenery. I’m eagerly awaiting the companion novel as I can’t wait to revisit the dazzling world Chokski has created. Maya is a fantastic character, although she’s had a pretty secluded upbringing she’s fierce and eager for a life where she isn’t judged on her gender and isn’t made to live in the shadow of her future husband. Amar, oh gosh, talk about swoony princes. Prepare yourself for major feels and fangirling!! What’s great about this book is that it extends past the marriage; it’s so much more than an arranged marriage and what will happen between Maya and Amar. There are layers of mystery, magic and intrigue, it reminded me a lot of Cruel Beauty with a palace that seems to have a life of it’s own and is slow to reveal it’s secrets. The romance is slow to burn and highly addictive and if this is your type of thing then you will find yourself flying through the pages, highly anticipating the next interaction with a wildly beating heart. I loved what this romance represented; it was all about becoming equals, a partnership that can last and can never be extinguished, a connection that can be felt across space, time and worlds. 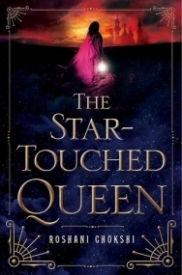 I highly recommend The Star-Touched Queen for fantasy fans and for suckers for magical retellings with their own unique twist. I would have loved to see more development between Maya and Amar, I feel like they would have been thick as thieves given the time. Also the world building? Oh I wanted more and more, Chokshi has such a lyrical way of writing, I would compare it to Marie Rutkoski and Renee Ahdieh, it’s beautiful and has the ability to pull you into the story and allow you to experience everything first hand. I never wanted to leave the magical Night Bazaar with its lush wildlife and vivid scenery. I’m eagerly awaiting the companion novel as I can’t wait to revisit the dazzling world Chokski has created. I don’t actually read much fantasy novels because I visually enjoy the genre more than reading it but this book was such a delight to read. At first glance, I never thought that I would pick this book up because it feels a bit overwhelming. I have zero idea on Indian mythology but I have read from somewhere that this novel parallels Hades and Persephone so I gave this book a shot. Not to mention, my personal idea to widen the range of the books that I read. The first thing that had me going with the book is the writing style. Chokshi’s writing is lyrical and poetic that it made the whole experience magical and surreal. Another thing I loved in this book is the chemistry, sizzling if I may say so, between Maya and Amar. I could honestly feel their emotions radiate from my reader and they never fail to make me smile. Their banter is one of the things to look forward to because it’s sweet yet snarky. Maya’s journey is not that different from other heroines I have read before but I did feel that there is a certain strength in her personality, something that makes her unique. Her journey is more of a personal discovery and facing reality amidst the presence of magic and power. Amar’s character development fell short but it had a great potential. He just seems a little flat for me, but I’m looking forward to seeing more of him. I’m just glad there’s going to be a next book! Same goes for Gupta and Kamala. Overall, the book is written beautifully. It’s vibrant, enchanting, and poetic. I had a great time learning about Indian mythology. This book is perfect for fans of high-fantasy. Give Me A Hardcover of This, and I'll Marry You. The first time I read this book, I fell in love. It takes the first chapter for me to smile, and I happily devour the book without a single care for the world. Mythology, mythology, and mythology is like catnip for me. I can't resist it, and I will always come after it. Whether or not I like it is another question, but I'm confident enough to say that I like this catnip. YA High Fantasy, THE STAR-TOUCHED QUEEN has wonderful prose, a beautiful use of words, and a lovely, almost poetic style. It's what draws me into the book in the first place (along with the main character, Maya, whose narration is really enticing). It grabs onto the reader tightly, and it doesn't let go (and I doubt anyone wants to let go). From the very first words and the beginning, I can't help but smiling and admire Maya's personality and strength that is shown through her dialogue and internal thoughts. Maya has a cursed horoscope. (I admit that I'm not too into horoscope, but Maya's horoscope is particularly interesting because she is predicted to be in a marriage of death and destruction.) It isn't the only thing about Maya. No, Maya is trapped in a royal life and subjected to be obeying the whims of her husband and brothers and father. She longs for choices, and the second she has a choice, she begins to make her move and become... Well, larger than life itself. A legend, really. The romance is a vital part of the story, and I absolutely adore it. It's similar to old myths and fairy tales yet also an unique animal of its own. Familiar stories that immediately come to mind are "Beauty and the Beast," "Cupid and Psyche," but especially "Persephone and Hades." It's a strange mix between them all, as if Chokshi has taken bits and parts to make her own story. But nevertheless, the romance will draw you in. The story begins at the very word, and I'm enchanted from the riddles to its compelling mystery to its curious male lead with a certain aura around him. Magic is everywhere and in the very words of this novel. The ending is perfect. It's a nice conclusion that leaves me wishing for a sequel yet also afraid, because I don't want a sequel that might ruin this standalone. But I want more of the flesh-eating horse, the tragic villain, the main character, the prose, the setting of an ancient world with kingdoms clinging close to the fate the stars reveal... And I could go on and on and on, but you get my point, right? In conclusion, THE STAR-TOUCHED QUEEN is perhaps the best book I've read in 2016 so far. Hands down. With a delicious and spellbinding romance and its beautiful setup and roots in fairy tales, THE STAR-TOUCHED QUEEN will leave you satisfied yet also craving for more. I enjoyed this rich world. I felt like I was there seeing the lure with my own eyes. I loved the characters, the writing, and the setting. The writing style was a little hard to follow at first but I took off with it quickly and it was just so rich and lovely that I came to love it so much. It's very flowing and different which I really appreciated. It's nice to have something different for a change. So this book is really a Hades and Persephone myth retelling but Indian lure and that just pulled me in. I knew I had to read it. That sold me on it alone. I'm a sucker for the Hades and Persephone myth and as many Bollywood movies as I watch... yeah I knew this book would be mine. It didn't let me down, it was fun and never a dull moment, the world was fleshed out wonderfully, the characters felt real, and the can I again say how much I loved the lure? Because I just did. My biggest problem with this book was how predicable it was. There was seriously nothing that happened that surprised me. I knew every twist and turn, I even found myself skipping ahead just because I knew what was going to happen and found no reason to read it. So while I loved everything else about this book, the plot was just too easy to guess. Another thing I disliked about this book was how Amar didn't just tell Maya what was going on. This book whole book would never existed if he's just told her. So that made the plot really weak to me. Overall, I still recommend this book just for the lure alone. It's great. "The Star-Touched Queen" is a beautifully written story with lyrical prose that pulls you into this fascinating story. Maya has always lived with a curse hanging over her head related to her marriage. As such, she has resigned herself to never being married. However, fate has other plans for her and soon she is selecting a husband. As she journeys with her new husband to his kingdom, she learns things are much more complicated than she expected. With twists and turns and secrets and reveals, this book captured my attention and didn't let go until the very end. As a retelling of Hades and Persephone, I found this to be a lovely and fascinating read. I highly recommend for YA fantasy lovers! I am definitely interested in picking up the next book in this series.